You should always ascend slowly from a dive. This rule is as important as never holding your breath while scuba diving. Coming up in a controlled manner at the right ascent rate is essential to avoid decompression illness. You know that you should never hold your breath when ascending. The reducing pressure during the ascent causes the air in your lungs to expand, which is very dangerous. The air that you put in your BC (or your drysuit) at depth will expand in the same way, just as will all the little bubbles of air in your wetsuit. This will make you progressively more buoyant and it could cause an uncontrolled runaway journey to the surface. To prevent this you must carefully release excess air by operating the dump valves provided. Your instructor will watch carefully to see that you do this during your training. You should also remember that you will have absorbed inert nitrogen while you were underwater. You will need to give your circulatory system time to push that gas back out in the air you exhale. Today, almost every diver is equipped with a diving computer; your instructor certainly will be. These computers track your exposure to inert gases, as well as give you a readout of your ascent rate. There are visual and audible warnings if you exceed the maximum acceptable rate. As you know, pressure differences are greater as you near the surface. 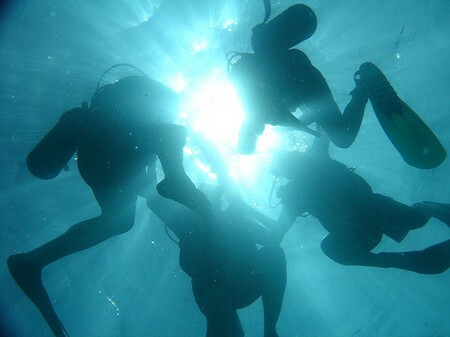 Most training agencies recommend that every diver stops between 6 m (20 feet) and 3 m (10 feet), and pauses there for between one and five minutes to decompress. Doing a free ascent – without a visual guide – needs complete buoyancy control. You need to be a competent diver and take extreme care to watch your instruments. An easier way is to inflate a buoy on a line. The buoy goes up to the surface, and you gradually wind in the line on to your reel as you steadily ascend. Another type of controlled ascent involves going back to the anchor line of the boat before you start your ascent and making your way up that. You will find a lot of divers prefer this because it leads directly to the boat, and it’s easier to swim underwater than to ascend farther out and have to swim on the surface. You will still need to make your safety stop at around 6 m (20 feet) on the way up. Whether you come up a line or make a free ascent, always remember to maintain neutral buoyancy by dumping excess air from your BC (or your drysuit). In that way, you can always ascend slowly from every dive. How to Boil Chicken Breasts?